BIG UPGRADE: John Deere launched HarvestLab a few years ago to provide high-speed access to information about harvested forages. The new HarvestLab 3000 offers added features. John Deere is rolling out HarvestLab 3000 for its self-propelled forage harvesters. The rising use of sensors in agriculture is bringing new opportunities for farmers. John Deere has been upping its game in the sensor business, including its recent purchase of Blue River Technology. And now it's offering an upgrade to an innovative sensor on its self-propelled forage harvesters. The company is rolling out HarvestLab 3000 to build on its on-the-go- sensor tech for use in forage harvest. The system allows producers to measure certain nutrient values for forages harvested for feeding livestock. The new HarvestLab 3000 can be mounted to a forage harvester to monitor forage constituents at harvest, and even map them. Or the system can be removed and used in stationary mode to evaluate forage nutrient quality at feeding. This is a Near-Infrared Spectroscopy sensor that can measure moisture, dry matter, protein, starch, neutral detergent fiber or acid detergent fiber. The system provides results immediately to allow users to get more frequent and representative samples, rather than using periodic, nonrepresentative samples measured using wet chemistry analysis. 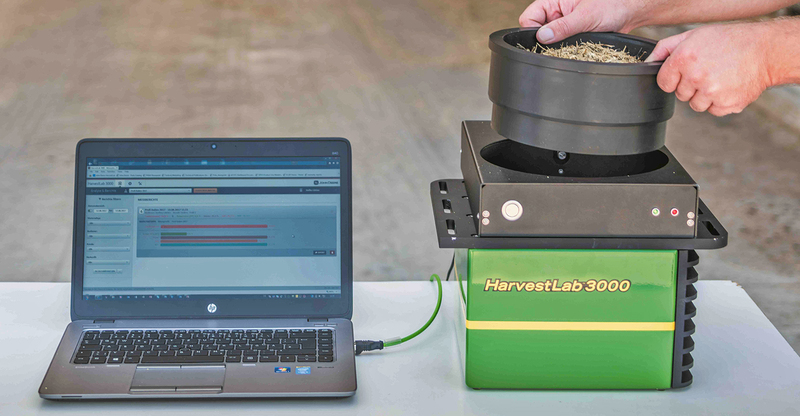 The HarvestLab 3000 can measure up to 10 nutrient values of feed going through the chute 4,000 times per second, and it provides real-time data-gathering. There's also the ability to map that information (when connected to GPS) for a better understanding of the field performance of forages. In announcing the new system, John Mishler, precision ag technology tactical marketing manager, notes that mapping has a lot of value for beef and dairy producers to optimize nutritional value of feed. "These nutrient values can be wirelessly transmitted to the John Deere Operations Center for analysis, future crop and nutrient application planning and for archiving field and crop history," he says. This quick analysis also allows a producer to make on-the-go adjustments to maximize feed quality. The two-mode design of the new HarvestLab 3000 provides added versatility. When mounted to forage harvesters, HarvestLab 3000 provides integrated, automatic length of cut adjustments based on moisture ranges preset by the operator. That allows a user to get optimum bunker density and high-quality silage. Also, inoculant applications can be more precise, matching information based on sugar and dry-matter readings. In stationary mode, nutritionists can analyze feed rations for crude protein, fiber and other characteristics to adjust rations for optimal nutrition and to reduce feed variability. With this system, different forages can be measured as often as possible, and can help guarantee precise tracking of silage put into a bunk or silo. The system can also help track quality changes taking place with forages before they're used in the livestock ration. The HarvestLab 3000 has a range of improvements over its predecessor. Mishler explains that the unit's memory has been bumped up from 32 megabytes to 2 gigabytes, and the user's web interface is improved. "Saving history data is now possible, and advanced diagnostics make it easier for users to more quickly troubleshoot issues if they arise," he adds. Customers can add the new system to their model-year 2018 orders for John Deere self-propelled forage harvesters. In addition, if you have a 7000 Series self-propelled forage harvester, the new HarvestLab 3000 can be retrofitted to your machine. That version, and its appropriate brackets, can be ordered from the local dealer for field installation later this year to get ready for season 2018. You can learn more at johndeere.com.